LAP LAMBERT Academic Publishing GmbH & Co. KG. Tharikh al-Islam II & III (2010) - Co-edited with Dr. E. Abdul Latheef, Assistant professor, Dept. of Arabic, University College, TVM, Prescribed Text book for First Degree Programme in Arabic under choice based credit and semester system (CBCS) in the University of Kerala and MG University, Published by University of Kerala. Methodology of Arabic (2010 (Ed 1) & 2014 (Ed 2)) - Prescribed Text book for First Degree Programme in Arabic under choice based credit and semester system (CBCS) in the University of Kerala and MG University, Published by Al Huda Books, Calicut. Genetic Structuralism in Arab Literary Criticism, Majalla Kalikoot , Vol. 5, Issue 2, May 2015, PP 25-32, Published by Dept. of Arabic, University of Calicut. "Psychological Criticism in Arabic", Proceedings of UGC Sponsored National Seminar on Modern Trends in Arabic Literature, Dept. of Arabic, PSMO College, Tirurangadi, Kerala,2013. "Return Migration from UAE: The Case of Kerala", The Philosopher Research Journal, ISSN 2319-8311, April-June 2013, Ed. 2, PP 206-209, Sree Sankara University of Sanskrit, Tirur, Kerala. "The Arab Spring", Arabic Teachers' Bulletin, March 2013, Vol 50, No. 4, PP 75-77, Published by Kerala Arabic Munshis Association, Kerala. "Principles of Education in the Prophetic Traditions", Proceedings of International Seminar on Hadith & Modern Science, February 2013, PP 48-58, Dept. of Arabic, Jamal Mohamed College (Autonomous), Tiruchirappalli, Tamil Nadu. Egyptian Women's Literary Criticism, Majalla Kalikoot , Vol. 3, Issue 2, January 2013, PP 66-87, Published by Dept. of Arabic, University of Calicut.
" Orientalist Approach in the Interpretation of Holy Qur'an", Al-Rayhan Journal, Vol II, No. 3, August 2012, PP 11-21, Dept. of Arabic, W.M.O. Arts & Science College, Muttil, Wayanadu, Kerala. "Kalila wa Dimna: the Question of Its Indian Origin", Majalla Kalikoot , No.3, Vol.2, December 2011, PP 35-51, Published by Dept. of Arabic, University of Calicut. "Return Migration from United Arab Emirates: the Case of Kerala", Proceedings of International Seminar on Socio-Cultural Exchange between UAE & Kerala, 2012. PP 15-20, Department of Arabic, University of Kerala. 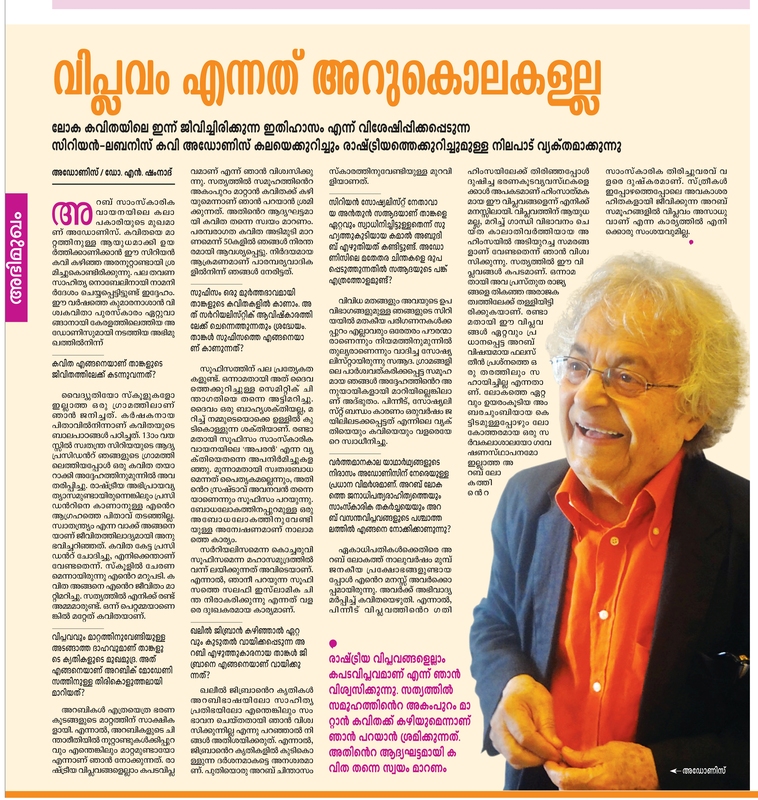 "Najib Mahfouz: a Genius in Arabic Novel", Arabic Teachers' Bulletin, February 2012, Vol 46, No. 4, PP 67 -68, Published by Kerala Arabic Munshis Association, Kerala. "International Status of Arabic Language", Al-Mahara Journal, Vol 1, Issue 1, December 2011, PP 27-30, Published by Department of Arabic, Maharaja's College, Ernakulam, Kerala. "Ibn Khaldun and his Introduction to History", Al-Katib Arabic Magazine, October 2011, PP 35-37, Published by K.M.M.M.O. Arabic College Staff Council, Tirurangadi, Kerala. "Influence of Western Schools in the Modern Arabic Literary Criticism", Seminar Proceedings of National Seminar on Arabic in the Modern & Contemporary Text & Context, 2011, PP 118-146, Published by Department of Arabic, University of Kerala, Kariavattom, Thiruvananthapuram, Kerala.
" Critical Approaches of Mustafa Sadiq al-Rafi'e & Taha Husayn: a study",Majalla Kerala, No.1 , Vol. 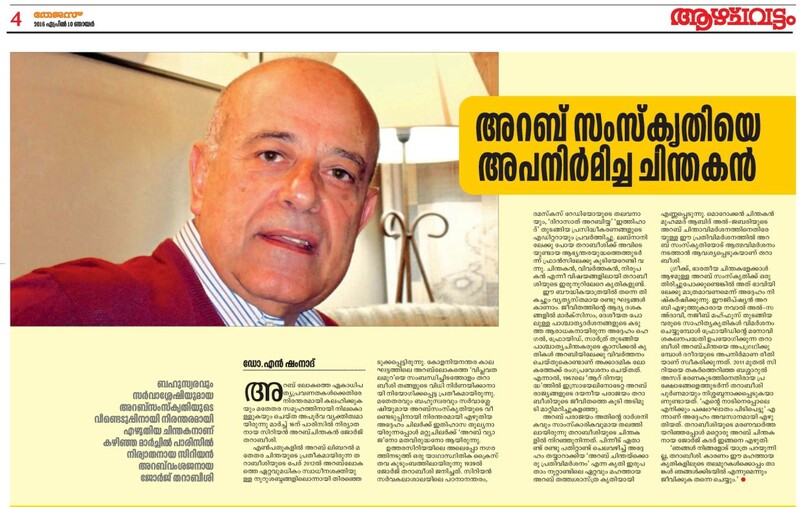 1, December 2010, Published by Department of Arabic, University of Kerala, Kariavattom, Thiruvananthapuram, Kerala.
" Principles of Education in Holy Qur'an ", Sawt al-Umma, Vol. 42, No. 11, November 2010, PP 54-58, Published by Darutta'lif wattarjuma, Banaras, Uther Pradesh, India.
" Psychoanalytical School in Modern Arabic Literary Criticism ", Majalla Kalikoot,No. 2, Vol. 1, June 2010, PP 13-24, Published by Department of Arabic, University of Calicut.
" Biruda padyapadhati: Anivaryamaya Parishkaranam " published in Madhyamam daily, on Ocober 9, 2009.
" Arabic Language and its universality ", Al-Risala Souvenir , January 2010, PP 86-88, Published by MSM Arabic College, Kadakkal, Kollam. Islamic Literary Criticism with Abul Hasan Ali Nadwi, National Seminar on Indo-Arabic Literature with special reference to Abul Hasan Ali Nadwi, Dept. of Arabic, MES Mampad College, Malappuram, Kerala, 19-20 February, 2014. Post-colonial Criticism, National Seminar on the New Avenues in Literary Criticism, Dept. of Arabic, PTM Govt. College, Perinthalmanna, Malappuram, Kerala, 22-23 October 2013. Psychological Criticism in Arabic, 2 Day National Seminar on Modern Trends in Arabic Literature, Dept. of Arabic, PSMO College, Tirurangadi, Kerala, 10-11 September 2013. Women's Literary Criticism in Egypt, National Seminar on Arabic Language & Literature: The Present Scenario, Department of Arabic, M.E.S. Asmabi College, Kodungalloor, Thrissur, Kerala on 19 July, 2012. Arabic Literary Criticism on Resistance Literature, National Seminar on Patriotism in Modern Arabic Poetry, Department of Arabic, Maharaja's college, Ernakulam on 15 December, 2011.
" Structuaralism in Contemporary Arabic critical reading " presented in National seminar on post modern trends in contemporary Arabic literature held at Department of Arabic, University college, Thiruvananthapuram on 21 October, 2009.
" India & GCC Countries: Diaspora and Development " presented in International seminar on New dimensions of Indo-Arab relations held at Department of Arabic, Maharaja's college, Ernakulam on 11 August, 2009.
" 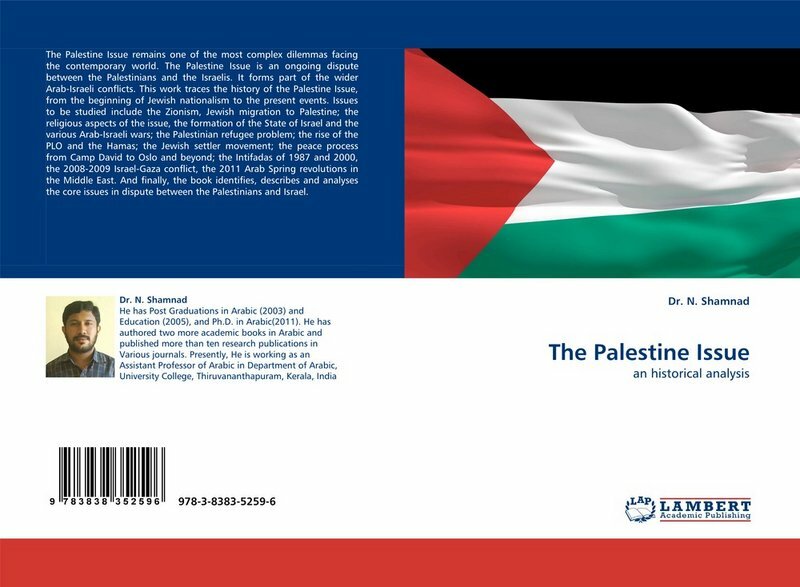 The Palestine Issue: an historical analysis " presented in Orientation programme for college teachers at Academic staff college, University of Kerala, Thiruvananthapuram on 09 May, 2009.